Once again we hit the floor running at this years IBS 2014 Show in New York. 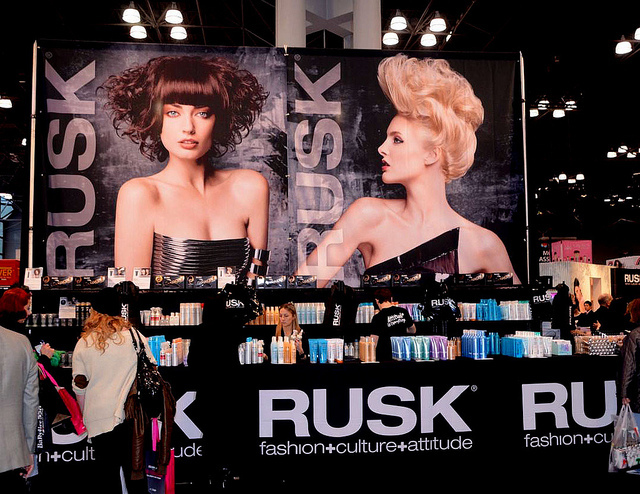 The largest beauty show of its kind to hit New York and almost 100 years old means they rule this market. The show took place at the Jacob Javits Convention Center from Sunday March 9th – Tuesday the 11th and expected over 60,000 beauty professionals to pass through their doors to visit over 500 exhibitors. Not only did they flood the floor with beauty industry professionals with their wheeled luggage bags, but there was wall to wall exhibitors, beautiful models, talented stylists and other members of this incredible industry. Partnered with the IBS Show was the IECSC (international Esthetics, Cosmetics and Spa Conference) which is billed as the premier spa and wellness event in the country. We stopped by the spa show for an hour or so on Sunday, but it was so packed we found it hard to move since their space was smaller then the IBS and there were so many smaller independent companies and wholesalers selling their products on the floor. Loads of demonstrations and plenty of willing participants for these demonstrations including my wife. Everything from products to remove your callouses, whiten your teeth, remove growths from your body and herbal teas and other spa soothing products. Since we had limited time and the IBS show is huge by any ones estimate, we opted to spend most of our time at the IBS Show. Now the original plan was to spend the one day at the show, but after squeezing through the aisles and the thousands of visitors, I realized it would never happen. This would be a two day project at least and as it turned out, that is what it was. Andy Peeke our IPA correspondent and on the scene reporter was to join me around noon on Sunday and I was going to take the morning to look around, take some photos and b roll video footage for our show videos. As we do at many of the shows we cover, we try to highlight the best of what we see at the show. This means walking the floors for hours trying to spot some of the hot companies and products and then deciding which ones will be interviewed. 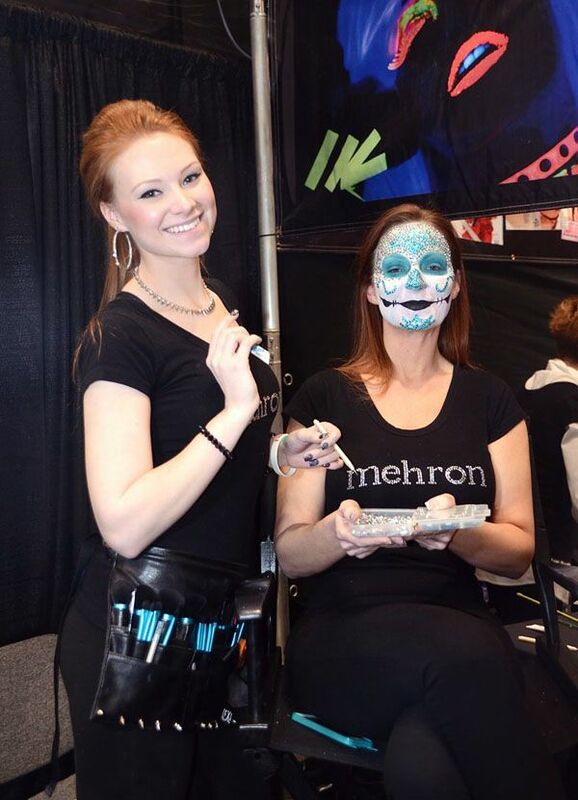 I stopped by the Mehron, booth who specializes in theatrical and body painting make-up were I was transfixed watching Alexys Fleming, AKA Lexy from MadeULook doing a beautiful, artistic and unreal job on a model. I later found out the model was her mom. Her face was full of beautiful rhinestones and fantastic theatrical make-up. I knew I had to return on Tuesday to see more and have Andy interview Lexy. You can see that interview video below. Watch how serious she is in her new persona and I will bet you will smile when she begins to talk. Great gal, is a Type 1 Diabetic she told me and doesn’t let anything hold her back. Here is a gal with talent, looks and moxy. Got to love her and so does the 250,000 subscribers she has on YouTube. Andy joined me at the show and off we went to some of my picks. I wanted to re-visit the Marrakesh booth, because I knew Andy would have fun there. They had a beautiful Belly Dancer, what else would they have at a Marrakesh booth. As you will see in the video Andy and Janet Huey AKA Jala the Belly Dancer had a great time as Andy joined her on stage to learn some belly dancing technique. Andy, stick to what you do best. As you will see below we featured this company in our show video and also created a nice video as Andy talked to some of their satisfied customers including Jala the Belly Dancer. As we listened to the many testimonials for their hair products, we decided to include them in our Best of Show article. SunFX is the world’s number one professional spray tan according to their CEO of Americas, Brett Robson. This company is in 60 countries and invented the first spray on tan applicator. With a comfortable feel and an adjustable flow control it makes spray on tanning easy for just about anyone. We laughed as all the women stopped by his booth to gawk at Remington their model who was more then happy to jump off the stage to take photos with the ladies. I could see in Andy’s face a bit of sadness because he is also an actor/model and has done gigs like this one too…Watch the show video to see Andy take it off too. Next stop on our list was Beauty and Pin Ups Hair Care Products, a relatively new company that really knew how to put on a show. Not only was their booth one of the larger ones at the show, but it was modeled after a 1950’s Drive in complete with the most beautiful car hops. As we arrived at the booth we were just in time to meet the Grammy Award Winning violinist Miri Ben-Ari who was the spokesperson for the company at the show. Andy and Miri hit it off and you will enjoy the interview in this video. Miri played for the audience, but unfortunately our sound system couldn’t pick up the sound properly, so you will have to simply download some of her amazing works from iTunes or other music store online. Beauty & Pin-Ups creator, Priel Maman is a talented stylist who you will see briefly talking to Andy in our video. Unfortunately in our short video we only had time to interview Miri, so next time we will catch up with Priel at next years show. Now I love the folks at RUSK and my single favorite product is GLEAM a wonderful Lusterizing Creme that detangles and leaves hair frizz-free. I have been using it now for years and alas its product cycle is over and GLEAM is no more. Their marketing director Gretchen Shomo offered me another product she felt might take its place, but promised to look through the closets in their offices for some Gleam. Hey Gretchen, I just found some on Amazon.com and other online retailers, so I should be OK for now :-). They were kind enough to give Andy and I some other product, you will see Andy with his new slicked back hair on day two of the show. Thanks Rusk, he looks like a little too clean cut now, we like the rugged Andy with oh so much hair. RUSK is always one of the most innovative companies we have worked with and each year we love to spend some time with Gerard Caruso their Director of Style who fills us in on the hottest new styles. In the video you will see him show us the latest in hair styles and color. You can see more on RUSK in our Show Video. We were running out of time and Andy looked really pale, so we stopped at our friends booth Staci Thomson at Sun Labs. You may have seen her in last years show video with Sheri another fav, who didn’t attend this years show. Staci looked great and I didn’t recognize her since her weight loss from last year, she is now a 10 in my book. Go to our IBS 2013 article and video to see her then…she is a blast. Staci took Andy by the hand, some how convinced him to take all of his cloths off and get in their spray tan booth. She then proceeded to give him a beautiful instant body tan. If you want to see a well tuned body, you will just have to watch the show video to see Andy get his tan on. Well it was now late on Tuesday and the show was closing but there was one last interview we had scheduled. It was with Dana Lupton the executive vice president of IBS which is owned and run by Questex Media. Dana was sensational, fun and full of information about the show, the industry, where it is now and where it is going in the future. Andy and Dana could have been an act because they played off each other so well, watch the video you will enjoy it, guaranteed. We noticed that this show and this industry is not like many of the others we cover. We stopped attending some of the shows as they have become so much smaller then in the past, and some no longer encourage media coverage, a sure sign those industries are hurting. The beauty and spa industries however are not. For some reason men and women simply need to go to the spa or beauty salon to feel good and look good. I know that women and men today will spend more on products and treatments then they might on what we might consider the essentials. Looking good in business means doing more business and I think we all realize the importance of this industry. IBS is simply in the business of helping us all look and feel more beautiful. You don’t have to be vain to want to look your best and we know people that look good feel good too. Although we have thanked all of the companies and people that were kind enough to speak to us at the show, I wanted to do it one more time in this article. Without the support of the companies and the wonderful people we met at this show, it would not have been possible. We hope you enjoy the videos, we feel that if a picture is worth a thousand words our videos just saved us millions of words. Special Thanks to the companies in the photo industry that have supported IPA for many years by donating the equipment we use in our work.